From 20 October until 20 November FC Barcelona are launching a competition for fans all around the world for two tickets to see the Clásico between Barça and Real Madrid on 3 December. This initiative by the Club is available to all Barça fans around the world as it offers the winners the chance to travel to the city of Barcelona and enjoy one of the world’s top sporting events. The first derby against Barça’s main rivals is earmarked for the first weekend of December and to celebrate that fact, FC Barcelona is launching this competition. 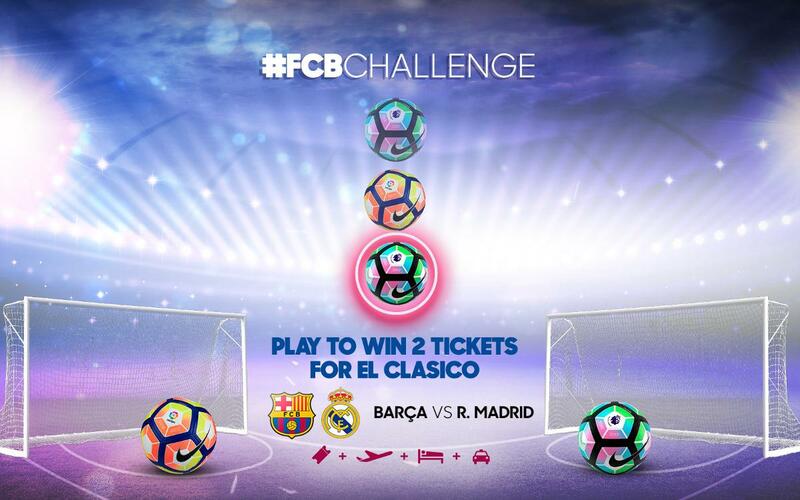 To enter into the draw for tickets, participants have only to register and overcome the five levels of the #FCBChallenge game. This tool will be available for both mobile/tablet and PC without the need to install any type of application. Once the five levels have been passed, the user will automatically be entered into the draw which will take place on 21 November in the presence of a notary. The lucky winner will have the chance to enjoy an unforgettable experience in Barcelona and to get behind Luis Enrique’s team in one of the most awaited games of the season.